1. See, inter alia, Glenn, Brian and Teles, Steven, eds., Conservatism and American Political Development (New York, 2009); Dueck, Colin, Hard Line: The Republican Party and U.S. Foreign Policy Since World War II (Princeton, 2010); Prasad, Monica, The Politics of Free Markets (Chicago, 2006), chap. 1; Pierson, Paul, Dismantling the Welfare State: Reagan, Thatcher, and the Politics of Retrenchment (New York, 1994); Blyth, Mark, Great Transformations (New York, 2002), chap. 6; Fischer, Beth, The Reagan Reversal: Foreign Policy and the End of the Cold War (Columbia, Mo., 2000); Hayward, Steven, The Age of Reagan: The Conservative Counterrevolution, 1980–1989 (New York, 2009). For very helpful comments, I thank the participants in the Arizona State University workshop on American Conservatism: Past and Future, especially Donald Critchlow. 2. Judis, John B. and Teixeira, Ruy, The Emerging Democratic Majority (New York, 2002); Chait, Jonathan, “2012 or Never,” New York Magazine, 26 February 2012. For Judis’s updates to the “emerging Democratic majority” analysis, see “America the Liberal,” New Republic, 19 November 2008, 20–22; and “Is This It?” New Republic, 6 December 2012, 12–14. 3. For example, Przeworski, Adam and Sprague, John, Paper Stones: A History of Electoral Socialism (Chicago, 1986); Gibson, Edward, Class and Conservative Parties: Argentina in Comparative Perspective (Baltimore, 1996); MacLean, Nancy, “Guardians of Privilege,” in Debating the American Conservative Movement, ed. Critchlow, Donald and MacLean, Nancy (Lanham, Md., 2009). 4. This paragraph relies on a number of works, including Carmines, Edward and Stimson, James, Issue Evolution: Race and the Transformation of American Politics (Princeton, 1989); Edsall, Thomas with Edsall, Mary, Chain Reaction: The Impact of Race, Rights, and Taxes on American Politics (New York, 1992); Sears, David and Citrin, Jack, Tax Revolt: Something for Nothing in California (Cambridge, Mass., 1985); Carter, Dan, From George Wallace to Newt Gingrich: Race in the Conservative Counterrevolution, 1963–1994 (Baton Rouge, 1999); Lowndes, Joseph, From the New Deal to the New Right: Race and the Southern Origins of Modern Conservatism (New Haven, 2009); and Tonry, Michael, Punishing Race: A Continuing American Dilemma (New York, 2012). 5. Greenberg, Stanley B., Middle Class Dreams: The Politics and Power of the New American Majority (New Haven, 1994). 6. Some scholars argue that “traditional” racism has been replaced by either “racial resentment” or unconscious bias as detected by the Implicit Association Test. 8. Shear, Michael D., “Demographic Shift Brings New Worry for Republicans,” New York Times, 7 November 2012. 9. For example, Bolce, Louis, Maio, Gerald De, and Muzzio, Douglass, “The 1992 Republican ‘Tent’: No Blacks Walked In,” Political Science Quarterly 108, no. 2 (1993): 255–70. 10. Przeworski and Sprague, Paper Stones. 11. Judis and Teixeira, Emerging Democratic Majority, 38; Alan Abramowitz, “Déjà vu All Over Again? Why a Repeat of 1994 Is Highly Unlikely,” available at: http://www.centerforpolitics.org/crystalball/articles/aia2009092402/ (accessed 18 April 2013). 12. Trende, Sean, The Lost Majority (New York, 2012), 146–48. On immigration and fertility trends, see http://www.pewhispanic.org/2012/04/23/net-migration-from-mexico-falls-to-zero-and-perhaps-less/ (accessed 18 April 2013). Fertility rates have also dropped sharply for foreign born women in the United States: http://www.pewsocialtrends.org/2012/11/29/u-s-birth-rate-falls-to-a-record-low-decline-is-greatest-among-immigrants/ (accessed 25 April 2013). 13. Warren, Jonathan W. and Twine, France Winddance, “White Americans, the New Minority? Non-Blacks and the Ever-Expanding Boundaries of Whiteness,” Journal of Black Studies 28, no. 2 (1997): 201, 211, 215. 14. http://www.pewhispanic.org/2012/11/07/latino-voters-in-the-2012-election/ (accessed 25 April 2013). 15. Trende, Lost Majority, 146–48. 17. 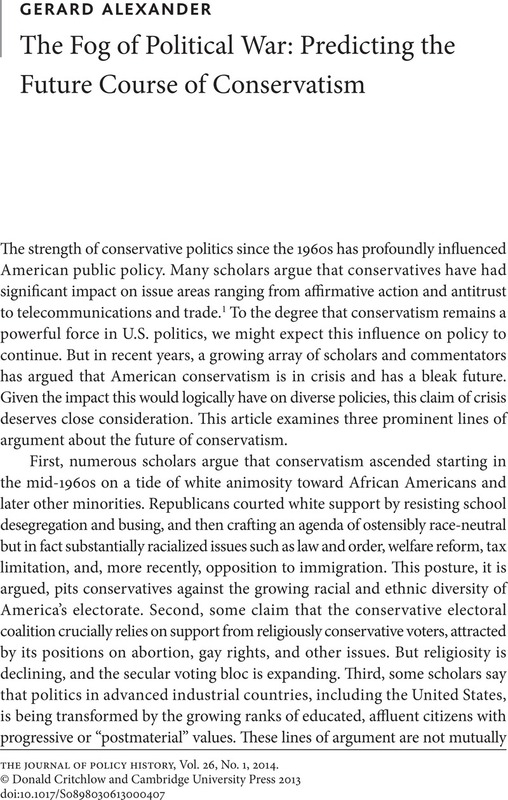 Lichtman, Allan, White Protestant Nation: The Rise of the American Conservative Movement (New York, 2008). 18. Prendergast, William B., The Catholic Voter in American Politics: The Passing of the Democratic Monolith (Washington, D.C., 1999), 127; Gifford, Laura Jane, The Center Cannot Hold: The 1960 Presidential Election and the Rise of Modern Conservatism (DeKalb, Ill., 2009), 168–96. 19. Kabaservice, Geoffrey, Rule and Ruin: The Downfall of Moderation and the Destruction of the Republican Party (New York, 2012), 59. 20. Prendergast, The Catholic Voter; Pew Forum on Religion and Public Life: http://www.pewforum.org/Politics-and-Elections/How-the-Faithful-Voted-2012-Preliminary-Exit-Poll-Analysis.aspx (accessed 25 April 2013). 21. For example, Allitt, Patrick, Catholic Intellectuals and Conservative Politics in America, 1950–1985 (Ithaca, 1993). It is intriguing that the three leading contenders for the 2012 GOP presidential contest were Catholic or Mormon; only Ron Paul was a traditional Protestant. 22. Cunningham, Sean, Cowboy Conservatism: Texas and the Rise of the Modern Right (Lexington, Ky., 2010), 113, 144–45. 23. Barry Goldwater referred to himself as “a man who is half-Jewish” at a Madison Square Garden rally; Peter Kihss, “18,000 Rightists Rally at Garden,” New York Times, 8 March 1962. 24. Trende, Lost Majority, 155–59, suggests that the prediction also relies on a fourth assumption: that liberals will be able stably to maintain their increasingly ethnically diverse electorate. He observes that “the history of multi-ethnic coalitions in this country has not been a harmonious one.” He cites examples of the fracturing of local and state “black-brown-white” coalitions in recent years in ways that could foreshadow a much more complex political future than straight-line projections imply for the Democratic coalition. 25. Frank, Thomas, What’s the Matter With Kansas? How Conservatives Won the Heart of America (New York, 2004). 26. Williams, Daniel, God’s Own Party: The Making of the Christian Right (New York, 2010); Layman, Geoffrey, “Religion and Political Behavior in the United States: The Impact of Beliefs, Affiliations, and Commitment from 1980 to 1995,” Public Opinion Quarterly 61, no. 2 (1997): 288–316. 27. Frank, What’s the Matter With Kansas? 76. 28. http://www.foxnews.com/story/0,2933,105081,00.html (accessed 18 April 2013). 29. Bruce, Steve, God Is Dead: Secularization in the West (Hoboken, N.J., 2002), chap. 11; Swatos, William and Christiano, Kevin, “Secularization Theory: The Course of a Concept,” Sociology of Religion 60, no. 3 (1999): 209–28. 30. Loftus, Jeni, “America’s Liberalization in Attitudes Toward Homosexuality, 1972–1998,” American Sociological Review 66 (2001): 762–82; Farrell, Justin, “The Young and the Restless? The Liberalization of Young Evangelicals,” Journal for the Scientific Study of Religion 50 (2011): 517–32. See also Pew Research Center, “Trends in Political Values and Core Attitudes: 1987–2007, Political Landscape More Favorable To Democrats,” available at: http://people-press.org/http://people-press.org/files/legacy-pdf/312.pdf (accessed 16 April 2013). But see Smith, Buster and Johnson, Byron, “The Liberalization of Young Evangelicals: A Research Note,” Journal for the Scientific Study of Religion 49 (2010): 351–60. 31. Judis and Teixeira, Emerging Democratic Majority, 149–51; also Edsall, Thomas, Building Red America (New York, 2006), 218–19. 32. Pew Forum on Religion and Public Life, “‘Nones’ on the Rise: One-in-Five Adults Have No Religious Affiliation” (Washington, D.C., 2012), available at: http://www.pewforum.org/uploadedFiles/Topics/Religious_Affiliation/Unaffiliated/NonesOnTheRise-full.pdf (accessed 18 April 2013). 33. Salam, Reihan, “Getting Irreligion,” National Review, 11 June 2012: 25–26; http://www.thedailybeast.com/newsweek/2012/10/14/the-gop-s-secularism-problem.html (accessed 18 April 2013). 34. Hadaway, C. Kirk, Marler, Penny Long, and Chaves, Mark, “What the Polls Don’t Show: A Closer Look at U.S. Church Attendance,” American Sociological Review 58, no. 6 (1993): 741–52. 35. Stark, Rodney, “Secularization, R.I.P.,” Sociology of Religion 60, no. 3 (1999): 249–73. 36. Putnam, Robert and Campbell, David, American Grace: How Religion Divides and Unites Us (New York, 2010), 76; Newport, Frank, God Is Alive and Well: The Future of Religion in America (New York, 2012). 37. For objections to these objections, see Bruce, Steve, Religion in the Modern World (Oxford, 1996), 52–59. 38. Smith, Christian, American Evangelicalism: Embattled and Thriving (Chicago, 1998). 39. Putnam and Campbell, American Grace, 370–377. 40. Hanley, David, ed., Christian Democracy in Europe (London, 1994); Kselman, Thomas and Buttigieg, Joseph, eds. European Christian Democracy (Notre Dame, Ind., 2003). Italy’s Christian Democrats collapsed in the 1990s, but not because of religio-cultural change. 41. Putnam and Campbell, American Grace; Layman, Geoffrey, The Great Divide: Religious and Cultural Conflict in American Party Politics (New York, 2001). 42. Dutton, Frederick G., Changing Sources of Power: American Politics in the 1970s (New York, 1971); Sticherz, Mark, Why the Democrats Are Blue: Secular Liberalism and the Decline of the People’s Party (New York, 2007), 133–43. 44. Judis and Teixeira, Emerging Democratic Majority, 42–44, 72, 177. 45. Callahan, David, Fortunes of Change: The Rise of the Liberal Rich and the Remaking of America (Hoboken, N.J., 2010). 46. Inglehart, Ronald, The Silent Revolution: Changing Values and Political Styles Among Western Publics (Princeton, 1977); Inglehart, , Culture Shift in Advanced Industrial Countries (Princeton, 1990); Inglehart, and Welzel, Christian, Modernization, Cultural Change, and Democracy (Cambridge, 2005), e.g., 7–8. 48. Inglehart, Silent Revolution, 215; Inglehart and Welzel, Modernization, Cultural Change, and Democracy, 53; also Inglehart, Culture Shift, 12, 280–282. 49. Winograd, Morley and Hais, Michael D., Millennial Makeover: MySpace, YouTube, and the Future of American Politics (New Brunswick, N.J., 2008). 50. Judis and Teixeira, Emerging Democratic Majority, 147. 51. Harper, Steven J., The Lawyer Bubble: A Profession in Crisis (New York, 2013). 52. For prominent claims about the effects of economic ideas, see Hall, Peter, ed., The Political Power of Economic Ideas (Princeton, 1989); Blyth, Great Transformations. 53. Arguably the very notion of postmaterialism has an important particularistic foundation. It is predicated on the notion that people who are sufficiently secure materially will basically cease to concern themselves with the conditions, including policy conditions, that might ensure continued prosperity. This now seems like an artifact of an earlier period in which prosperity was considered by some to be a technocratic matter. Once economic growth was solved as a managerial matter, politics would be free to move on to other things. The period since the early 1970s has not treated this assumption kindly. Successive cohorts have been forced by periodic downturns to confront nettlesome questions about what exactly can deliver growth. 54. Saletan, William, Bearing Right: How Conservatives Won the Abortion War (Berkeley and Los Angeles, 2004). 55. Critchlow, Donald, The Conservative Ascendancy (Cambridge, Mass., 2007); Hayward, Steven, The Age of Reagan: The Fall of the Old Liberal Order, 1964–1980 (Roseville, Calif., 2001). 56. Buckley, William F., Let Us Talk of Many Things: The Collected Speeches (Roseville, Calif., 2000), 476. 57. Trende, Lost Majority, 142.